Nothing speaks of summer in Maine like wild blueberries. These berry beauties combined with creamy cheesecake ice cream, crafted into popsicles dipped in dark chocolate, spell a fabulous finish to a sumptuous summer picnic supper. The Magic of the chocolate sauce is that it hardens onto the cold ice cream almost instantly. The recipe is one of the most simple and easy chocolate sauces imaginable. This tasty treat will delight at first bite. 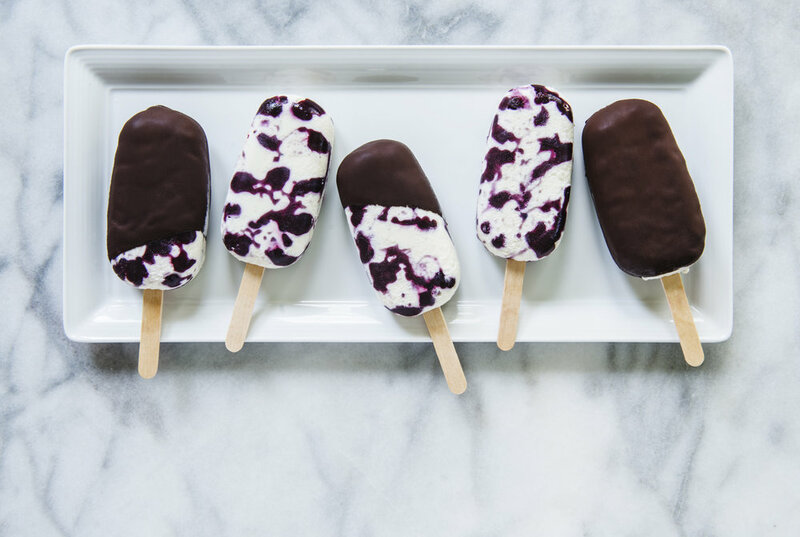 My memorable recipe for Maine Blueberry Cheesecake Ice Cream Popsicles makes about 12 popsicles. Use horizontal silicon molds with holes for the sticks. Make sure your sticks fit the mold openings. Most molds come with the appropriate sticks. Choose blueberries that are small firm, plump, fragrant with a dark rich berry color and a dusty white bloom, which is their natural protection from the sun. You can also use frozen Wild Maine blueberries. 1. Place the sugar, lemon juice, cornstarch, salt and water in a medium size saucepan on low heat and stir until the sugar is dissolved. 2. Stir in the blueberries and raise the heat to medium. 4. Set aside and make the ice cream base, allowing the sauces to cool to room temperature. 1. Using a whisk or a hand mixer, beat the cream cheese until smooth. 2. Add the heavy whipping cream, condensed milk, and vanilla extract and beat the mixture on high speed until soft peaks form. 3. With your squeeze bottle of strained sauce, swirl graceful lines of sauce into each mold. Dot in a blueberry here and there. This will ensure a beautiful berry presentation on the outside. 4. Using a small flatware pointy teaspoon, not a rounded measuring spoon, add a layer of the ice cream base to each of the molds. 5. With a smaller spoon, swirl in a bit of the cooked blueberries. You can use a narrow utensil to assist in swirling. 6. Sprinkle a layer of graham cracker crumbs about an 1/8 inch thick. 7. Repeat steps 4 & 5 until each mold is filled. 8. Repeat step 3 to give a finished blueberry presence to the exposed outside. 9. Insert the sticks into the molds. If there is any left over base and sauce, freeze it in a covered cardboard, plastic or metal container. 10. Leaving the molds in their protective trays, freeze them for at least 6 hours. Over night is best. 11. After un-molding the pops, place each popsicle into an individual cellophane, plastic or waxed bag, and close securely to store in the freezer until ready to serve. This prevents freezer frost. 1. Measure the coconut oil into a 4 cup liquid measuring cup. This allows room for stirring in the cacao powder. 2. Slowly and gradually stir the cacao powder into the coconut oil until the mixture becomes homogenous and smooth. 3. 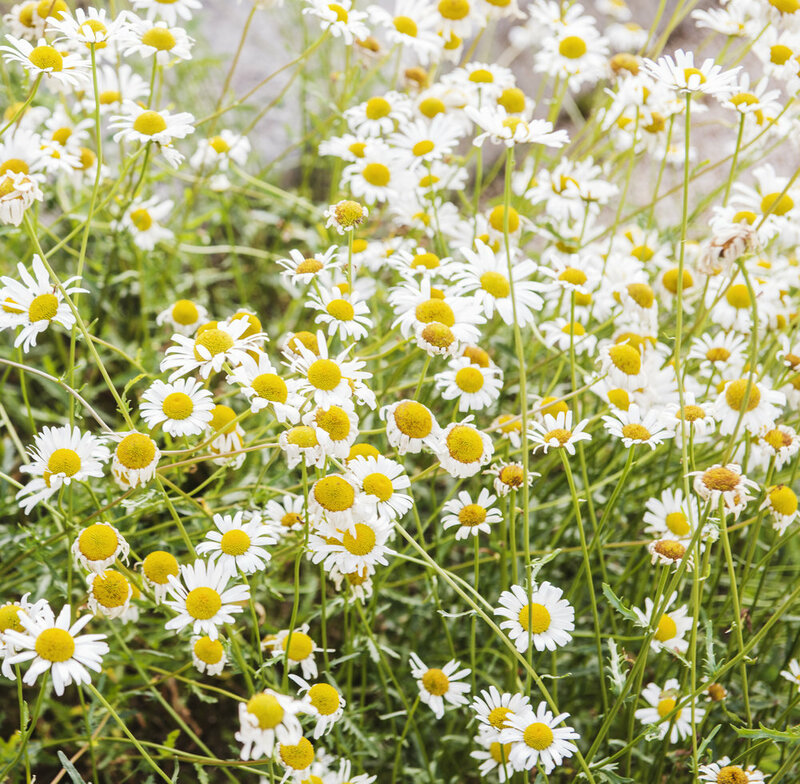 Store in a 2 cup tightly covered lidded glass jar at room temperature until ready for use. 4. 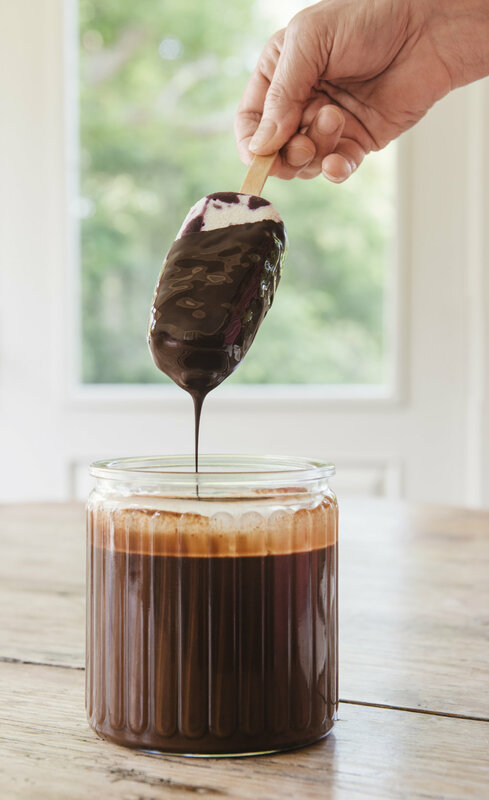 Upon request for a chocolate covered popsicle, uncover the popsicles one at a time and dip into the sauce. The Magic of the chocolate sauce is that it hardens onto the cold ice cream almost instantly. This is one of the most simple and easy chocolate sauces imaginable. Tip: Thinning the chocolate sauce with a bit more coconut oil will make a thinner shell that hardens more quickly. If the room temperature is below 70 ˚F, the chocolate sauce may harden. Simply place the jar into warm water until it becomes liquid again. Thanks for joining me in our sumptuous summer supper alfresco at Maine's Mead Meadow. I hope you can take the time to enjoy the recipes. We were invited to historic Mead Meadow, in picturesque Kittery Maine, to shoot our delightful summer outdoor meal. This water front paradise is a restored 140 year old farmstead, originally a 20 acre estate, was called Mead Summer House. Included: the main house, a horse and buggy carriage house, which is now a guest cottage, a boat house and the original well. The lovingly restored buildings are now nestled on 4 acres of manicured grass surrounded by wild and cultivated flowers, raspberry bush stands, shrubbery and original trees. The garden shed was torn down and its naturally weathered old New England stones have been transformed into a spacious patio surrounded by potted herbs and flourishing flowers, with a bucolic view of the rear grounds and coastal cove. Turkey Hill "Decadent Delights", featured in Shoot Magazine with commentary by director Ben Dolphin.